New Earthmate PN-60 and PN-60w with SPOT Satellite Communicator, updated topographic detail for U.S. as well as Canada, and the addition of DigitalGlobe satellite and aerial imagery to GPS data offerings. SALT LAKE CITY, UT, August 3, 2010 – DeLorme, the innovation leader in mapping and GPS technologies, is showcasing its newest PN-Series GPS receivers and related products at the Outdoor Retailer Summer Market trade show, now through August 6 at the Salt Palace here in Salt Lake City. Also on display is DeLorme Topo North America 9.0 GPS maps and PC software, and DigitalGlobe worldwide aerial and satellite imagery for display on PN-Series receivers. The headliner for DeLorme is still the Earthmate PN-60w with SPOT Satellite Communicator, which has generated enormous interest since its pending release was announced earlier this year. The PN-60w with SPOT Satellite Communicator is the world’s first handheld GPS with Type & Send outbound text satellite messaging, enabling users to stay connected with friends, family, and emergency services, from locations around the world. SpotAdventures.com,or Geocaching.com. In addition, family and friends can track a user’s progress via Google’s free online maps. Manufacturer’s suggested retail price (MSRP) is $549.95. SPOT services are activated via subscription. DeLorme has also released the Earthmate PN-60. While it’s not enabled for satellite communication, it does (like the PN-60w) offer a wealth of next-generation GPS features. They include GPX file support for superior flexibility in managing and saving waypoint, geocache, and track files; an elevation profile tool that pinpoints user location; new power management and display options that significantly extend battery life; and a full 3.5 GB of onboard memory, ample enough to store maps and aerial imagery for countless outdoor adventures. MSRP is $399.95. Both PN-60 models offer an icon-based interface for easily moving around the devices’ map, function and activity screens. The PN-60 models are the latest in the DeLorme Earthmate handheld lineup, which also includes the popular PN-40 (MSRP $299.95). All PN-Series receivers are ruggedized, waterproof (IPX-7), WAAS-enabled, and equipped with a high-sensitivity 32-channel GPS chipset, and dual-core processor for blazing-fast performance. They come with new DeLorme Topo North America 9.0 GPS maps and PC software included, and offer the widest available array of supplemental map and imagery display choices (more information below). DeLorme Topo North America 9.0 software is the successor to Topo USA. As the new name suggests, it now includes detailed topographic and street detail for both the U.S. and Canada, along with places of interest including attractions, restaurants, lodgings, and businesses of all kinds. The updates include over 210,000 new or updated roads, 11,000 U.S. national forest trails, and BLM and State Trust lands. A new one-button synchronization feature makes GPS file exchanges (maps, aerial imagery, waypoints, geocaches, tracks, and routes) fast and effortless. For geocachers, Pocket Query downloads are now automatic. DeLorme Topo North America 9.0 is available by itself for PN-Series users who wish to upgrade their maps and GPS file management capabilities, or anyone who wants a standalone PC mapping program. MSRP is $99.95. With this latest product release, DeLorme also announces the availability of DigitalGlobe satellite and aerial imagery for display on PN-Series receivers. DigitalGlobe provides imagery for locations worldwide, at ultra high-resolution (as high as 30 cm per pixel). The DigitalGlobe imagery is available from DeLorme via a low-cost $29.95 annual subscription, which entitles unlimited downloads. DigitalGlobe subscription cards can be purchased from authorized DeLorme resellers. For even more map and imagery choices, the DeLorme MapPack offers multiple U.S. aerial imagery types, official USGS 1:24,000 (7.5-min.) and Natural Resources Canada (1:50,000) topographic detail, and NOAA nautical charts. MapPack maps and imagery are also available for a $29.95 annual subscription, with unlimited downloads, and can be purchased from authorized DeLorme resellers. 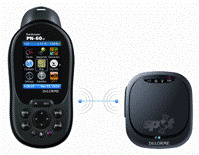 DeLorme PN-Series GPS receivers, Topo North America 9.0 software, and DigitalGlobe and MapPack subscription cards, can be purchased from online resellers, and at leading outdoor retailers and electronics stores. For more information, call 800-561-5105.